One of our biggest contests of the year is coming up, so get yer swatches ready! 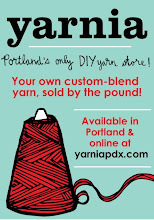 What’s your favorite Yarnia blend that you’ve made over the past year? It just might be our favorite, too! During our Seventh Birthday Party next on Friday, February 20th, we’ll be accepting entries for Yarn of the Year. Got a little bit of that favorite blend left over? Knit or crochet up a little swatch and bring it in! If your yarn is chosen as our Yarn of the Year, we’ll carry it here in the shop as a house blend (or as close a match as we can, given the fibers on hand), and not only will you get to name it, but you’ll also win a $25 Yarnia gift card! Don’t have any yarn left over that’s calling to you? You can come into the shop and make up a blend anytime up until the evening of the party itself, to submit for consideration. Who knows? Your next custom blend just might be the winner! Yarn of the Year Contest!